I am trying to encode a Disney DVD using handbrake. After the initial scanning Handbrake comes up with 99 titles for the movie, 77 of which are duration times within 2-3 minutes of the film. I tried using 3 different titles, and each time the encode has the movie, but it is in the wrong order. All 3 times the movie starts correctly, but then it skips about an hour into the film, then goes on past the credits and plays what it skipped at the end. Any way of fixing this? DVD producers create 99 titles on DVD simply want to protect them from pirate and commercial use. As Disney new released DVD has 99 titles and the DVD movie size is more than 40 GB, Handbrake will crash when it launch to scan this kind of DVD disc. Here i will show you how to rip 99-title DVD with Handbrake on Mac. Discs like this list multiple instances of a main feature title, all with different lengths. But only one of them is the real thing. HandBrake does its best to guess the correct one, but it often fails, leaving you with the kind of out-of-whack movie you've described. So, the trick is discovering the real title of the 99-title DVD. To do that, insert the DVD and let Apple's DVD Player application play it. Skip through previews and commercials before you can watch the movie. When the main feature finally begins playing, push your cursor to the top of the display to reveal the menu bar. From that menu bar choose Go > Title (you can also Control-click or right-click on a movie and choose Title from the contextual menu). Scan the long list of titles, and you'll see a checkmark next to one of them. This is the number of the disc's real main title. Make a note of it. Now return to HandBrake and instruct it to rip this title as the main feature. Tough you go stick with tips above, you may still have variety of Handbrake error messages on the Mac OS. 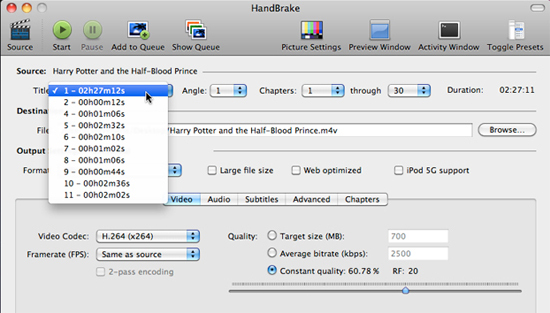 If you are not quite sure that you can handle with this issue, that you'd better give Handbrake Alternative a try. iFunia DVD Ripper constantly updates to conquer and defeat latest DVD copy protections, like DVD with 99 titles. Besides, iFunia DVD Ripper is All-in-one DVD ripping solution which can backup all your DVDs, like home-made DVDs, region 1-6 DVDs, as well as encrypted DVDs. No technical knowledge or skills are needed to rip 99-title DVD movies on your Mac. The simple instructions below will guide you through the easy step of the way. 1. Run iFunia DVD Ripper and load DVD by click the Media Browser icon at the upper right corner. 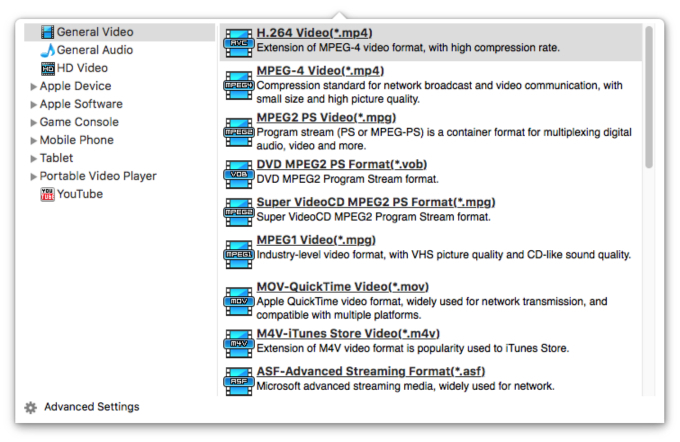 It can add three kinds of DVD (DVD disc, DVD folder which include a "Video_TS" folder and a "Audio_TS" folder, IFO file). 2. Select the output format you need, or you can select format according to your device. Click the conversion button to start converting.